For the Pakistani families taking part in the CGAP Smallholder Diaries research in Bahawalnagar, Punjab, artees (agricultural agents) form an integral part of their financial lives. In many cases, families have had inter-generational relations with a specific arthi family. While the arthi’s main function is purchasing crops from farmers, they also serve as a kind of mini-bank, providing fertilizer and pesticides on credit, and often serving as money guards that hold onto smallholders’ savings. Transactions are stored in a paper registry, but only a few families keep their own record or verify the arthi’s version. We have found that artees in the two Smallholder Diaries villages are just one part of a complex value chain. At the very bottom are local villagers who buy crops directly from farmers. Called beoparis, these buyers do not provide credit or inputs to farmers. They offer farmers a lower price than artees do, but farmers may still sell to them since beoparis can get them money more quickly. Above the beoparis are two main arthi types. 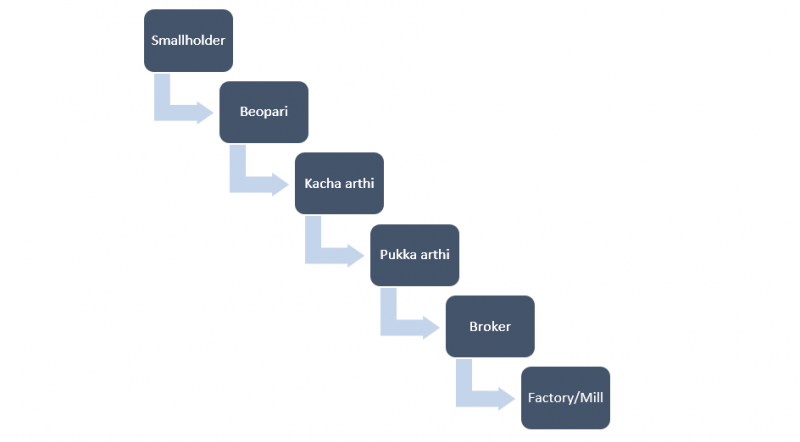 Katcha (informal) artees deal with farmers and sell on to what are called pukka (formal) artees who are connected directly to factories and mills. When smallholders obtain inputs on credit from the arthi, they usually pay back with a portion of their harvested crop. They have a rough idea what the rate will be, but exact rates are not finalized until after the harvest. Although artees feature prominently among families in the Pakistan sample, only 17% of them listed the agents as their most important source of borrowing (74% listed friends and family). Most of the families who prefer the arthi appreciate that they do not ask for repayment until the harvest, an important attribute for families affected by the agricultural cycle. But many also indicated that they earn lower prices for their agricultural production that they could since there is pressure to sell to the arthi right after harvest, instead of waiting for prices to increase over time. For some families, this can have a large impact on income. 43 year-old Farid and 40 year-old Seema and their four small children are one such family. They grow wheat, rice, and fodder and occasionally sell milk. Sometimes Farid also works at the rice factory and Seema does needlework. For their family, financing from their arthi covers many agricultural expenses and even some non-agricultural ones, but they have had difficulty obtaining funds from the arthi in a timely manner. In December 2014, a late credit from the arthi adversely affected their wheat crop. Though Farid does not like the arthi very much, he sees no other way to obtain fertilizer and feels majboor [helpless]. The agricultural value chain in the Pakistan Smallholder Diaries sample. That said, Farid does appreciate that he can pay back the arthi after the harvest. “With the agent, we don’t have a fixed time to return the debt. Whenever the crop is ready, we sell and repay the agent,” he explains. He thinks that banks, however, are too expensive and take too much interest and that MFIs charge extra interest that would be difficult to pay back if you cannot pay them on-time. Farid also prefers to save with the arthi since money at home gets spent easily. Would it be best to provide financing alternatives to the arthi system for farmers, or work to make the arthi-farmer relationship more transparent and optimal? Perhaps there is room for a bit of both. The written ledger for farmers could be converted to a new record keeping system using mobile technology, for example. This could help farmers keep better track of the large amounts of money they have saved with the artees. Farmers may also benefit from a short-term loan that can pay off arthi debt and allow them to obtain inputs, giving them the breathing room to take advantage of increasing prices. Furthermore, though smallholders may have their issues with the artees, they return to them because of the flexibility of repayment time (after the harvest) and softer rules in case of a bad crop year. Other institutions hoping to serve this market would need to have elements of this flexibility in order to compete.